We’re pleased to announce a new handy tool for keep track of markets within the Coinigy Trading Platform. 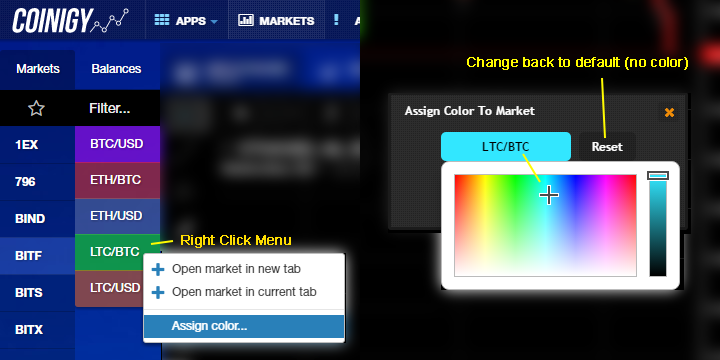 Users now have the ability to assign specific colors to markets within the market list. This can be used to keep an eye on markets from a visual standpoint. Thanks to Coinigy user Sangye for the suggestion. Click on the market name in the dialog box and choose the color you’d like to assign to this market. Click the “Assign color” button to designate a color for this market. Note: To remove color formatting, follow the steps above, however click “Reset” instead of selecting a color. As per usual, should you run into any issues please feel free to get in touch with us via support.